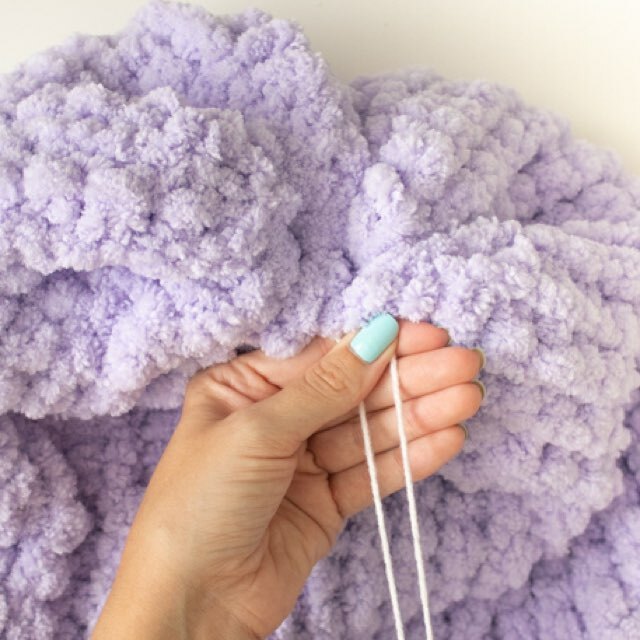 Make a cozy floor pouf with the new Loopity Loops yarn to use as a floor pillow or footrest! 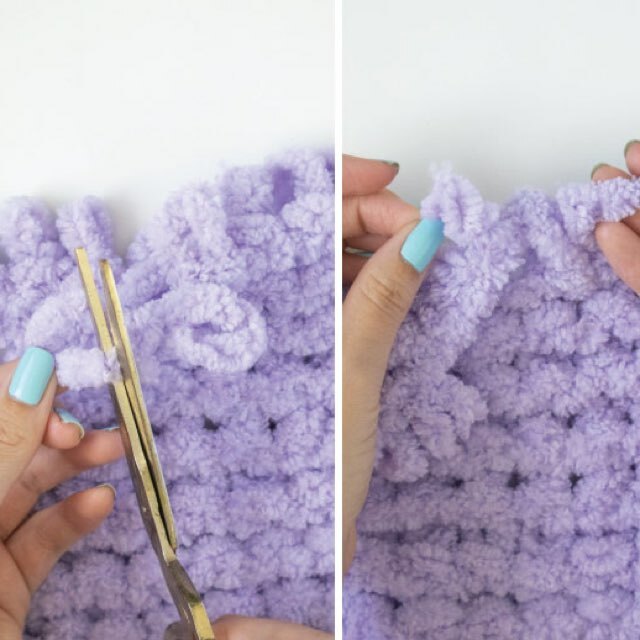 Find the end and pull out a long section of yarn. With the loops facing up, count 30 across. Pull the 31st loop through the 30th one in order to create the second row. Continue across the 30 loops, then go back the other way, continuing to pull the working yarn loops up through the existing loops. When you eventually reach the end of one skein, cut one of the loops so that you have a small piece of straight yarn. Weave this through the loops. Then do the same with a new skein and continue the pattern where you left off (similar to crochet). Note, it’s easy to miss a loop here and there, so check your work after each row to make sure you’ve looped everything through. If you make a mistake, you can simply pull the loops free to fix it. It’s a quick fix! When you’ve finished about 2 1/2 skeins of yarn, stop and DO NOT cut the yarn yet. The length of the piece will be the entire circumference of the pouf, so the longer it is, the wider around the pouf will be. Join the two ends of the piece. Note, one side of the piece will have a different look than the other (a front and a back). Whichever side you want facing OUT, put those two sides together. 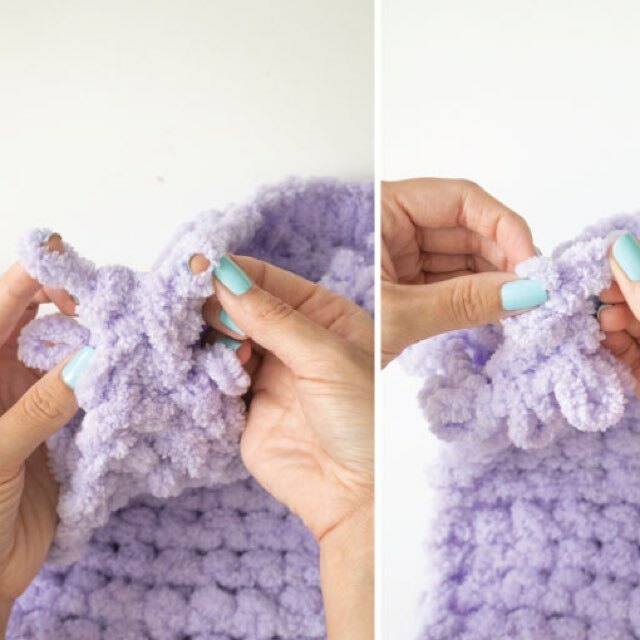 With one hand, group the open loop of one end with the already knitted loops of the opposite end. 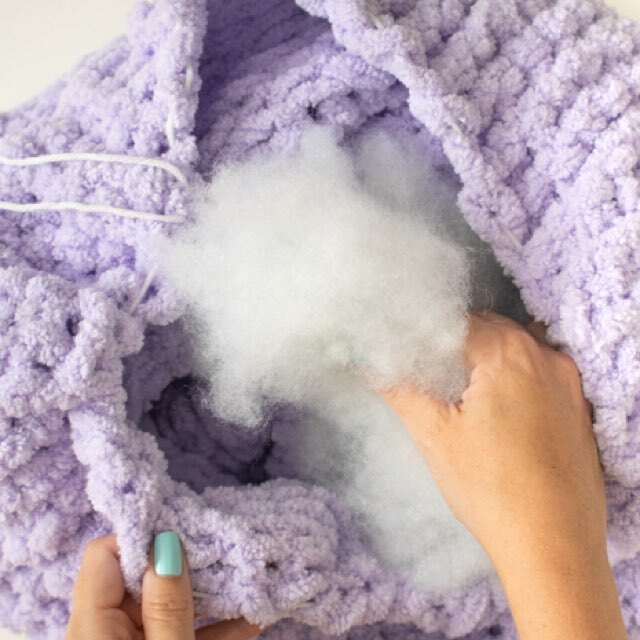 With the working yarn in the other hand, pull the next loop through both openings to bind the sides together. Repeat with the next loop and all the way across the piece. 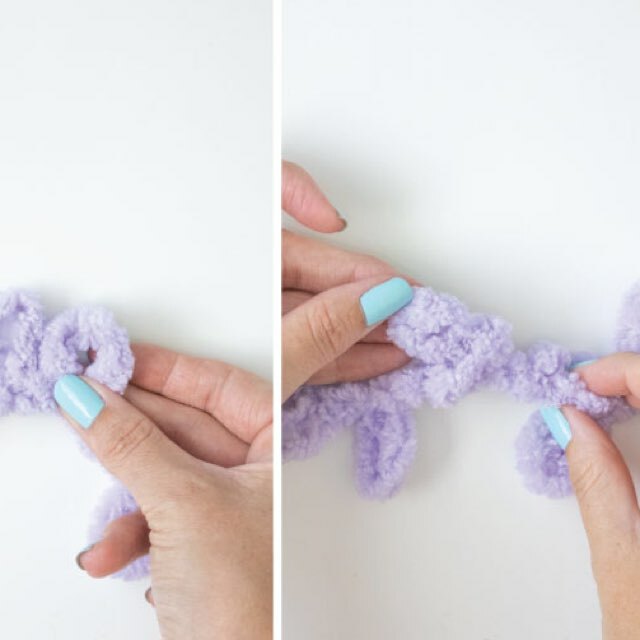 To finish the loops and prevent unraveling of your pouf, take the left loop and pull it through the right loop. Do this only once. Then take the new right loop and pull it through the left loop. 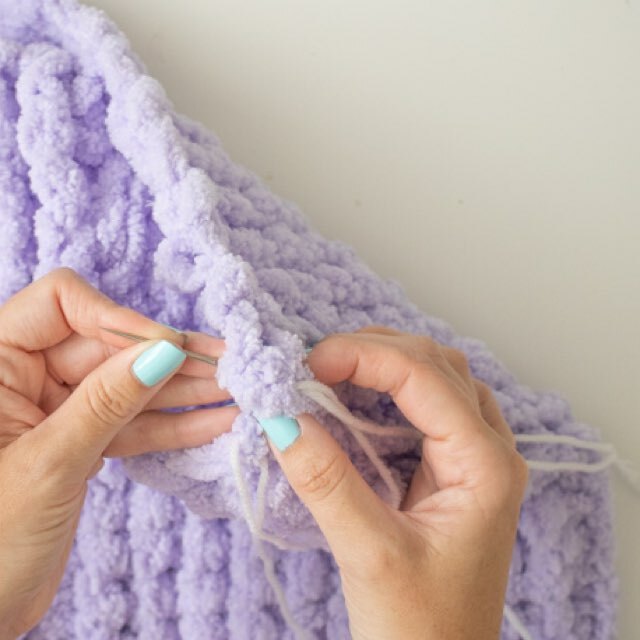 Continue this pattern all the way across the final set of loops in order to bind them together in a chain-like stitch. When you reach the end, you should have only one loop. 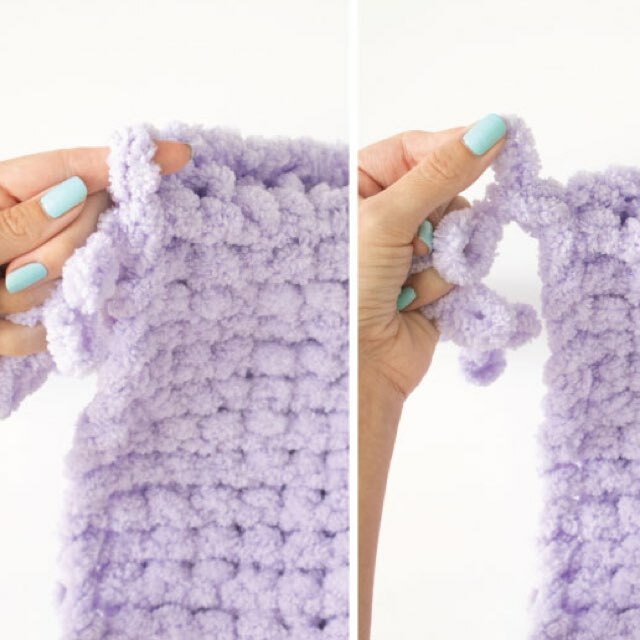 Cut the NEXT loop free so that you have an extra piece of yarn. 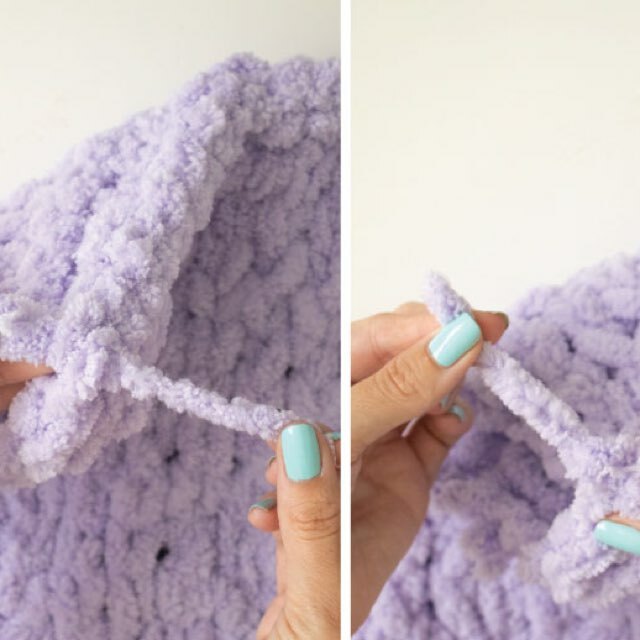 Pull the piece of yarn up through the loop and pull tight. 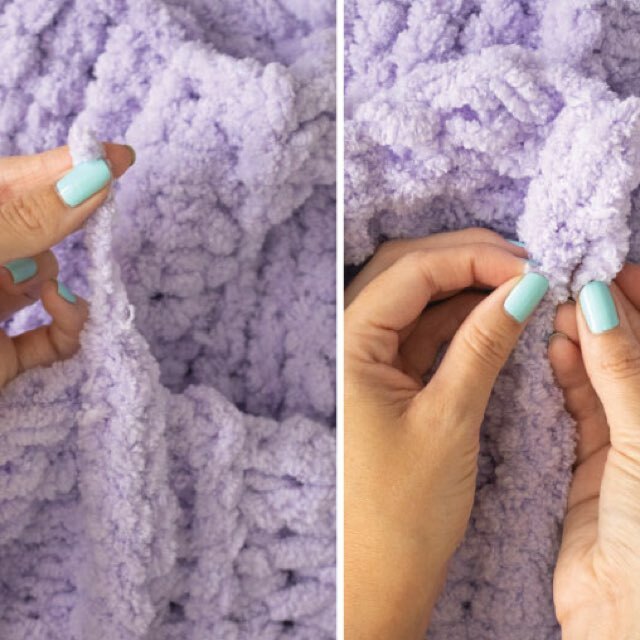 Weave the piece of yarn through the seam you’ve just knitted. Then turn the piece right side out. Thread a piece of regular yarn onto a darning needle. Starting at the seam of one open end, thread the needle and yarn through the loops all the way around the opening until you reach where you started. 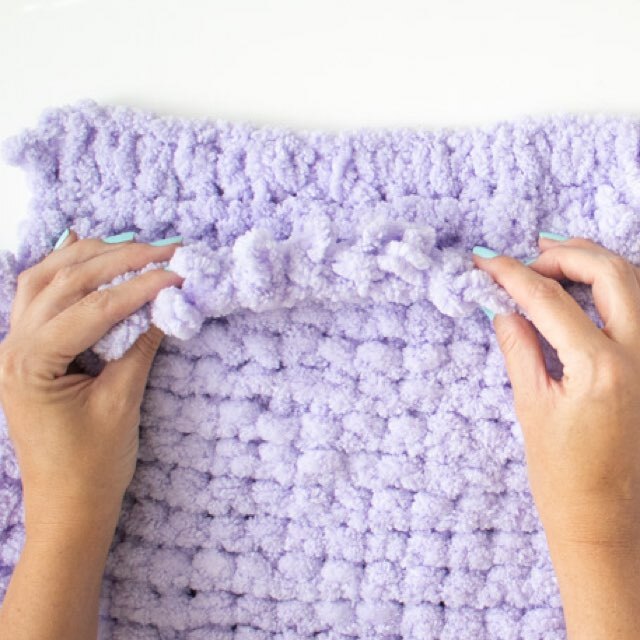 Pull the yarn tight to pull the end of the pouf into a drawstring and tie tightly with multiple knots to secure. Flip over to the other side and fill with fiberfill until very full. 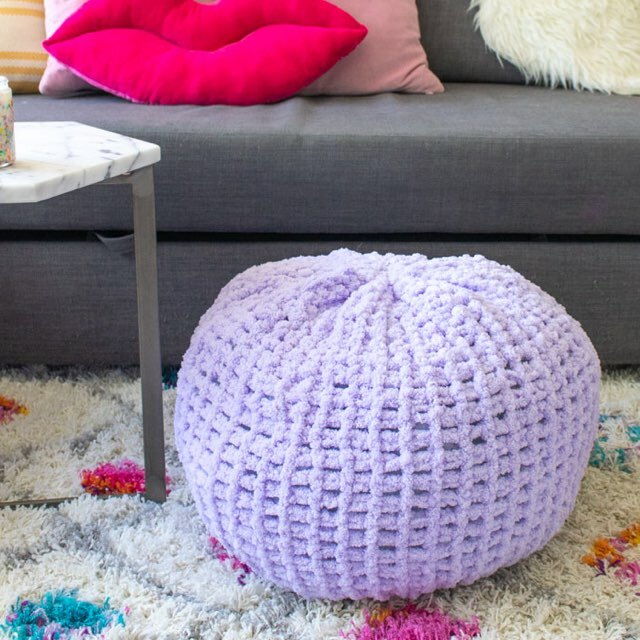 Repeat the drawstring at the open end and close tightly to finish the pouf!